One of the few trucks that CPCC has in their garage. Students practice "pre-tripping" a truck. Trucking companies across the U.S. have a hard time finding drivers. After all, wages aren’t what they used to be and being on the road for weeks on end can be a tough sell. In Charlotte, the demand for drivers is especially high. The city has long had commercial driving schools, but now Central Piedmont Community College is offering its own and it has a wait list of 500. 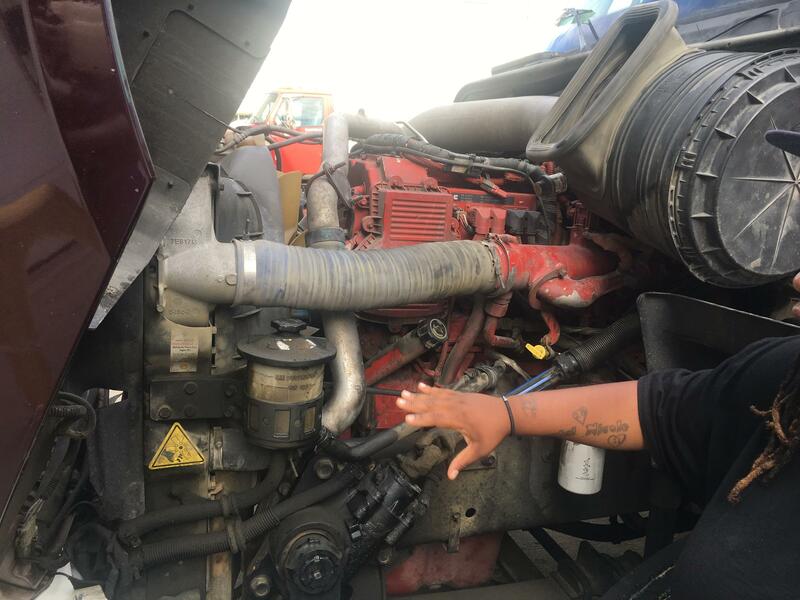 Monae Robinson explains the parts under the hood of the truck. Monae Robinson looks into the hood of a truck and points out what each part does. Before you even learn how to drive a truck you learn how to "pre-trip." That means checking things like fluid levels, leaks and cracks, and tire pressure. “It’s a lot. You’ve got to do a brake test. You’ve got to check your gauges, make sure everything is good before this truck moves the lot,” says Robinson. She's half-way through this intensive two-month course. The goal is to get her commercial drivers’ license in August. 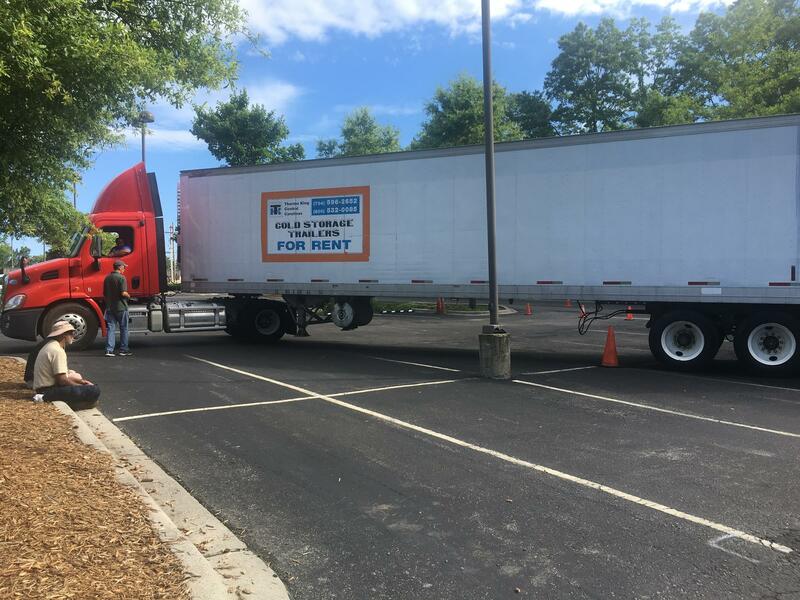 She and about 35 other students in the class at CPCC’s campus in Huntersville learn safety habits, defensive driving, cargo handling and mechanics, as part of the drivers’ training. Like many here, truck driving runs in Robinson’s family. CPCC started the certificate program a year ago, at the request of companies in need of drivers. They gave equipment to get the program started. CPCC now offers the course for $200. That’s a lot less than commercial driving schools which charge around $4,000. Tractors and trailers were donated to CPCC for the start up of their truck driving program. 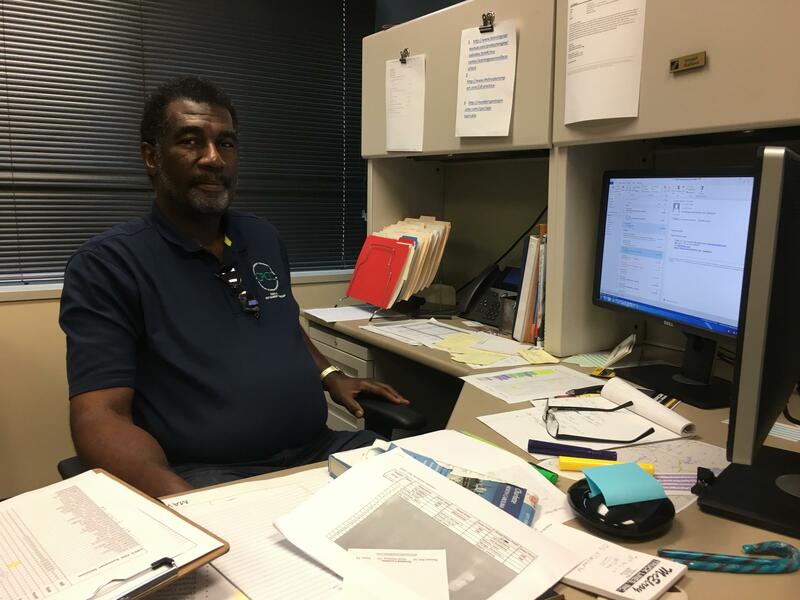 “If you look at job postings for truck drivers in Charlotte, North Carolina you will find 1,418 postings,” says Hani Mahmassani, a professor at Northwestern University, who tracks the trucking industry. He’s searching the American Trucking Association’s database for job openings. The Charlotte region has over 17,000 truck drivers. That’s a lot for a region this size. Mahmassani says it also has a higher number of job openings and those postings are only anticipated to grow. “There’s a lot of retirement expected in that industry. So by 2020 it’s expected for the demand for drivers to increase by something like 20 percent," he said. The Charlotte Chamber estimates about 3,500 jobs will need to be replaced in the Charlotte region over the next decade, as drivers retire. Growth in the industry is projected to create another 2,400 jobs. And then there’s the high turnover rate. According to the American Trucking Association, it’s 74-percent nationally. That translates into a lot of demand. Joe Stafford, chair of CPCC’s truck driving program, says nearly all of his students get jobs right away. “So some of them apply for the jobs while they got their permits, so once they get their license all they have to do is go straight to the company because they’ve already been through the screening process and they’re ready to go,” says Stafford. Truck drivers used to make a lot more and drive fewer miles. Wages began to fall after a push to deregulate the industry in the late 1970s. According to the Department of Labor, the median wage for a truck driver in the Charlotte region is $42,500 dollars a year, just under the national median. Many of them spend several days at a time on the road, sleeping in their trucks. More trucking companies like EPES Transport headquartered in Greensboro are making changes to recruit more drivers. The company seeks out CPCC students. “We’ve opened up different regional opportunities so people are home more. More dedicated. More local. Those generations want to be home more, they want to be not as far away and know what days they’re going to be out,” says Melissa Nishan, the company's director of recruitment. She says the company’s turnover rate is half the national average. Of course, the shorter routes don’t bring in as much money as the longer hauls. Monae Robinson is just eager to finish the class, get her license, and get out on the road. She still has a ways to go before that. “So we’ll have to do the full-out pre trip, all the skills, the straight back, offsets, and 90s. And then we’ll have to perform on the road with them before we can even go out to take our test,” says Robinson. If previous students are any indication, she’ll have a job in no time.